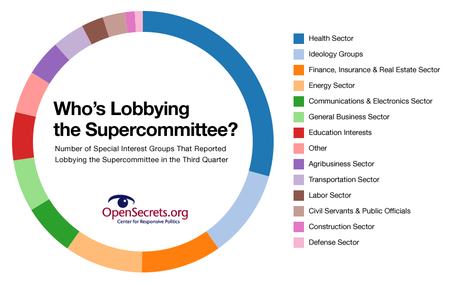 Lobbyists are essentially money consolidators. All the people who would like to have influence in Washington, but don't have enough money of their own, band together in groups and hire lobbyists to influence/buy their politicians for them. In theory, and often in fact, the lobbyists have personal relationships with either the politicians themselves, or their staffs. At a minimum they are skilled schmoozers. Lobbyists speak to politicians directly, and also organize events at which real voters (you and me) can speak to their politicians directly. Attendance at these events is usually limited to people who show up with a four digit check, to be handed not to the politician personally (too crass – buying a politician requires superficial subtlety), but to the lobbyist, who also does not hand it directly to the politician, but to a member of the politician's staff, who also does not hand it directly to the politician, but deposits it in his/her campaign fund. Nobody's hands get dirty (but it's not work for the squeamish). 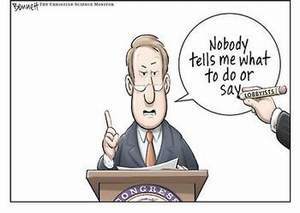 Lobbyists collect hefty fees from their clients with their promises to whisper in the ears of the right people. What their naïve clients don't know is that politicians, when finished pretending to care deeply about your point of view on pending legislation, slip out the back door to attend a similar deeply caring encounter with people/donors on the opposite side of the issue. In most cases the side that pays the most turns out to have the most persuasive arguments. The way Washington works today makes meeting with lobbyists a mandatory political chore. Election campaigns are expensive and must be paid for somehow. Politicians, like the rest of us, only have 24 hours a day to get their job done, thus are constantly looking for productivity improvements. 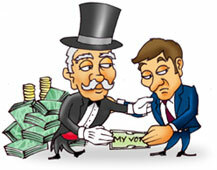 Lobbyists are an efficient way to collect money. Strangely enough laws limiting campaign donations are partly to blame for the undue influence of lobbyists, because a politician can no longer just accept a couple of million dollar checks from some wealthy donors and be done with it. Instead they have to collect thousands of one thousand dollar checks, which involves meeting with a lot of lobbyists. Furthermore I am committed to a new communication paradigm with Iowa voters. No more pretending to read and care about your emails, phone calls, personal visits and hired guns/lobbyists. Instead I will use all that liberated time exposing myself directly to your thoughts, and personally responding to them, through my website. Listening/lobbying 2.0. Initially we will probably have to struggle through some bad ideas (I have amazing ideas every day, but can never quite tell which ones are amazingly bad), but if all of us are committed to getting the money, and the lobbyists, out of politics, I am sure we will discover plenty of ways for me to hear you, and for you to know I heard you. That not only puts the lobbyists out of business, it puts your campaign donation back in your own pocket, where you can use it on something more productive than lobbying me. My website also increases transparency. Since everyone can read everything on my website, you will know who your competition is, you will find out what other Iowa voters think about your arguments, and you will get multiple chances to refine your pitch to be more persuasive. You will also know how I think about your proposal, at least for the moment. 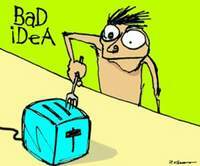 Since I change my mind when presented with new information (what do you do when presented with new information?) you will have the opportunity to provide me with new information, and possibly change my mind. No more doors on K Street closed to everyone without a check in hand. No more hidden compromises. Just honest government – Independent government. Accidental encounters are not included. I am not going to ask everyone who wants to shake my hand if they are a lobbyist. That's rude. I'm talking about registered lobbyists (it's like being a barber, you need a license). If you try to persuade me to your point of view, you are lobbying me, so you are a lobbyist. That's OK – you're the kind of lobbyist I will be happy to listen to.